Helper is a city in Carbon County, Utah, United States, about 110 miles (180 km) southeast of Salt Lake City and 7 miles (11 km) northwest of the city of Price. It is known as the "Hub of Carbon County". The population was 2,201 at the 2010 census. The city is located along U.S. Route 6/ U.S. Route 191, a shortcut between Provo and Interstate 70, on the way from Salt Lake City to Grand Junction, Colorado. 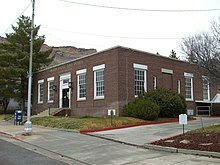 It is the location of the Western Mining and Railroad Museum, a tourist attraction that also contains household and commercial artifacts illustrating late 19th and early 20th-century living conditions. Helper is situated at the mouth of Price Canyon, alongside the Price River, on the eastern side of the Wasatch Plateau in Central Utah. Trains traveling westward from the Price side to the Salt Lake City side of the plateau required additional " helper" engines in order to make the steep (2.4% grade) 15-mile (24 km) climb up Price Canyon to the town of Soldier Summit. Helper was named after these helper engines,  which the Denver and Rio Grande Western Railroad stationed in the city. As of the U.S. Census  of 2000, there were 2,025 people, 814 households, and 559 families residing in the city. The population density was 1,132.7 people per square mile (436.8/km²). There were 925 housing units at an average density of 517.4 per square mile (199.5/km²). The racial makeup of the city was 92.59% White, 0.44% African American, 1.58% Native American, 0.25% Asian, 0.10% Pacific Islander, 3.90% from other races, and 1.14% from two or more races. Hispanic or Latino of any race were 11.31% of the population. There were 814 households out of which 31.8% had children under the age of 18 living with them, 51.8% were married couples living together, 11.2% had a female householder with no husband present, and 31.3% were non-families. 27.6% of all households were made up of individuals and 13.9% had someone living alone who was 65 years of age or older. The average household size was 2.44 and the average family size was 2.97. In the city, the population was spread out with 25.5% under the age of 18, 9.1% from 18 to 24, 26.1% from 25 to 44, 20.9% from 45 to 64, and 18.4% who were 65 years of age or older. The median age was 39 years. For every 100 females, there were 98.5 males. For every 100 females age 18 and over, there were 93.8 males. The median income for a household in the city was $30,052, and the median income for a family was $37,266. Males had a median income of $32,708 versus $22,500 for females. The per capita income for the city was $15,762. About 11.1% of families and 12.7% of the population were below the poverty line, including 13.3% of those under age 18 and 13.7% of those age 65 or over. Helper has two schools that belong to the Carbon School District (Carbon County, Utah). Located in western Helper is its lone elementary school, Sally Mauro Elementary, and located about a half mile east of the elementary school is Helper Middle School. Amtrak ( the National Passenger Rail Corporation) provides service to Helper station, operating its California Zephyr daily in both directions between Chicago and Emeryville, California, across the bay from San Francisco. The now defunct Rio Grande Zephyr also stopped at Helper. It also lies along U.S. Route 6/ 191, which split just north of the city - U.S. 191 heads northeast to Duchesne, while U.S. 6 heads northwest to Spanish Fork. Both continue together southeast to I‑70 just west of Green River. Robert Marion Mullins, Pulitzer Prize winning journalist grew up in Helper. ^ Amy Joi O'Donoghue (April 15, 2015). "End of an era: Mercury rule shutters Utah's oldest power plant". Deseret News. Retrieved April 15, 2015. many '50s-era plants would be forced to retire in lieu of costly capital investments. ^ The Utah Genealogical and Historical Magazine, Volumes 9-10. 1918. p. 187. ^ "Helper, Utah Köppen Climate Classification (Weatherbase)". Weatherbase. Retrieved 2 September 2018. 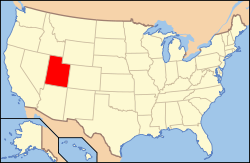 Wikimedia Commons has media related to Helper, Utah.